High definition giclee modern grace canvas printing artwork, picture photo printed on high quality canvas. A perfect Christmas and New Year gifts for your relatives and friends. 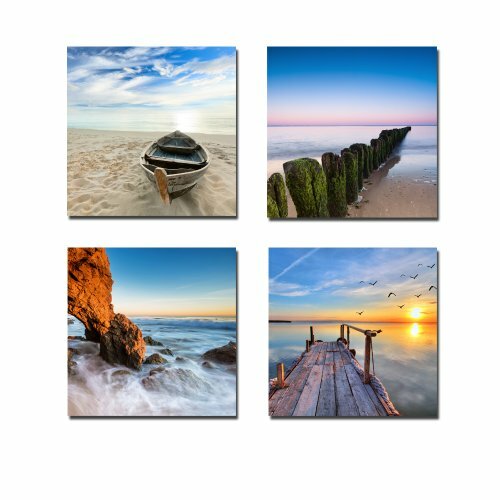 4 piece stretched and framed pretty decorative blue ocean sea beach canvas paintings wall art prints ready to hang for home decorations wall decor. Each panel has a black hook already mounted on the wooden bar for easy hanging out of box. Wieco Art does not offer its products for sale through any other third party except for AMAZON, buyer can report to us or AMAZON if you get counterfeit products from other sellers. A perfect wall decorations paintings for living room, bedroom, kitchen, office, Hotel, dining room, office, bar etc.. Due to different brand of monitors, actual wall art colors may be slightly different from the product image.